Light carves out the world around us. It separates night from day, and its particles are always in motion. 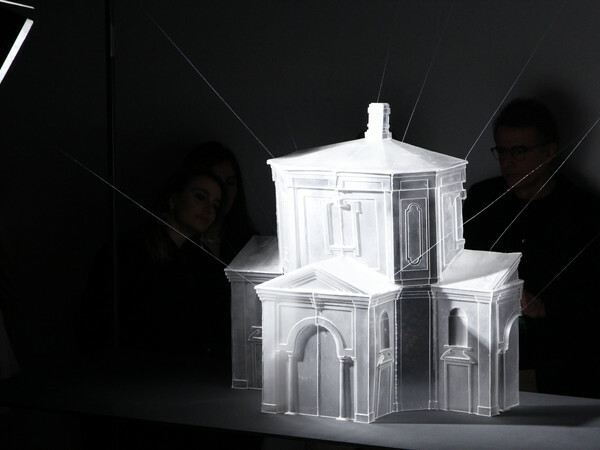 Recognizing these peculiarly architectural qualities of light, MADWORKSHOP, the Accademia di Architettura di Mendrisio and the Fondo Ambiente Italiano (FAI) are launching Light Theater, a new exhibition opening at Villa Panza in Varese, Italy on 10 February 2018. Director of the Accademia di Architettura di Mendrisio, Riccardo Blumer has spent the last six months working closely with the Academy’s students, studying the dynamics of light in space. This exploration is now culminating in an exhibition of ten elaborate new pieces that intrigue the eye and play with perception, illuminating and refracting the ocular experience. Inspired by everything from VR and sci- to the luminescent grandeur of high baroque, these visually stimulating installations are uni ed in their use of arti cial light as a sculptural medium. The exhibition was also inspired by the nearby Sacro Monte di Varese complex, recognised as a World Heritage Site by UNESCO. Several of the artworks also consider the history and scenography of this historic place, tracing ancient lines of pilgrimage through the surrounding mountains with light beams and immersive experiences. MADWORKSHOP Fellow Riccardo Blumer (b. 1959) graduated in Architecture from the Polytechnic University of Milan in 1982. He has received several awards for his designs, notably the Compasso d’Oro award for the ‘Laleggera’ chair, and today his designs can be found in the MoMA collection. In 1998, Blumer began teaching at the Architecture Academy in Mendrisio and, since 2006, the University of San Marino and the Internal Superior Institute of Indoor Architecture. He lives and works in Varese, Italy, where since 2017 he has been the director of the Accademia di Architettura di Mendrisio. The Martin Architecture and Design Workshop (MADWORKSHOP) supports technological craftsmanship in the arts and design. With a focus on socially conscious projects, MADWORKSHOP aims to make radical, sustainable, and lasting contributions to design discourse and society at large. The Architecture Academy in Mendrisio (Accademia di Architettura di Mendrisio — AAM) is a Swiss school of architecture and is one of the ve faculties of the Università della Svizzera italiana, USI. Its programs are taught in English and Italian, and more than half of its current 3000 students are international, making the Academy a lively place of cultural exchange. The Villa Panza is an eighteenth-century villa situated in Varese, Italy. Donated to the FAI by Giuseppe and Giovanna Panza di Biumo in 1996, today it houses a world-renowned collection of contemporary American art. There are now over 150 works in its permanent collection inspired by the themes of light and color, including the works of Dan Flavin, Robert Wilson, Wim Wenders and James Turrell.